I was tired of looking at and trying to clean the old biscuit colored toilet in the back bathroom. It flushed fine with its 1.6 gallon flush–a water saver in its day. But the tank and the bowl were stained with rust and calcium deposits that even scrubbing with a pumice stick did not help. The glaze was probably scraped right off the bowl. I had some trouble finding the dual flush .5/.95 Stealth toilet that I used in the master bath so I decided to buy two. Originally I was going to use a round toilet bowl to replace the round bowl. But I bought one on eBay and it broke in shipping. I realized the round bowl was not comfort height so I ordered an elongated to replace it. It is annoying that the dual flush tank and bowl have to be ordered separately and do not come as a set. This bowl is stamped with the .08 gallon flush for the single flush tank but it also is used with the dual flush tank or at least it has the same model number. 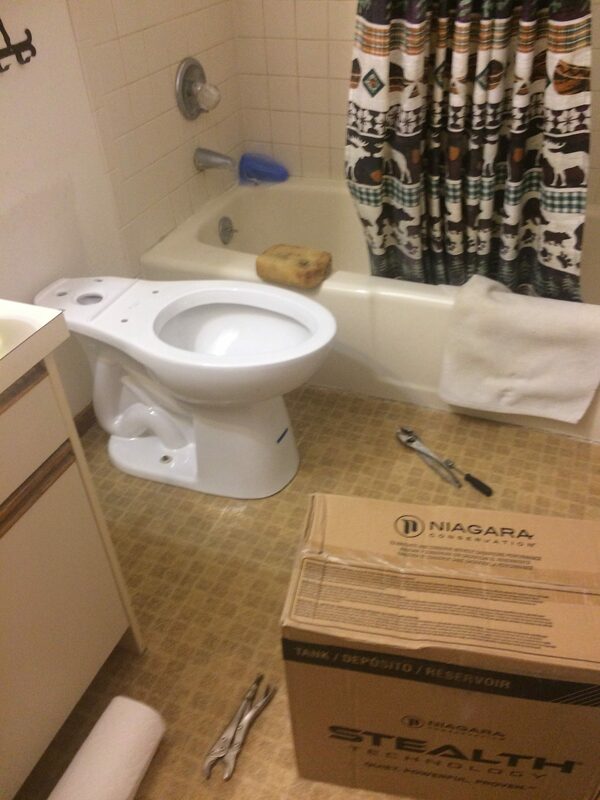 Replacing this toilet was very easy. The bolts came apart without a struggle and the water valve didn’t leak. I cleaned up the old wax and the dirt around the toilet line without too much trouble and was ready to set the new bowl. I bought reusable rubber toilet seals again because I’ll probably want to remove the toilet later and they are so much cleaner than wax. I just reused the old bolts and caps. The tank has an integrated gasket that fits on the toilet bowl and then the tank is tightened to the rear of the bowl. Since the toilet is taller than the one it replaced, I had to go over to the hardware store and get a longer 16″ water line. I connected the new line, turned on the water valve, and with no leaks the toilet was installed. I caulked the bottom edge with biscuit colored caulk to blend in with the floor. 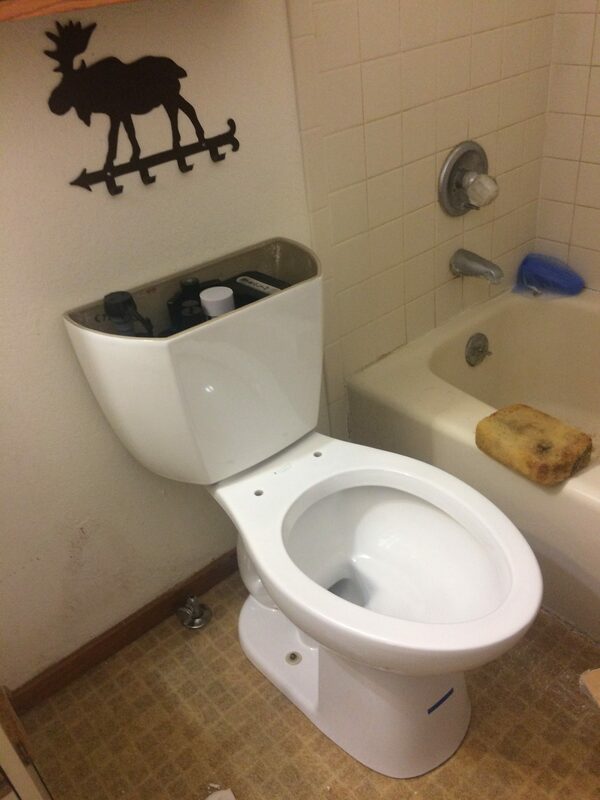 We bought a hard closing white wood toilet seat and it was inexpensive and easy to install. I bought a second toilet for the family room bathroom where the 1/1.6 dual flush toilet cracked at the bottom. That one was not sealed with caulk and the inspector said it had to be to pass inspection. Next I’ll change that one for a new Stealth. This entry was posted in Bathrooms, LEED Project, Plumbing. Bookmark the permalink.